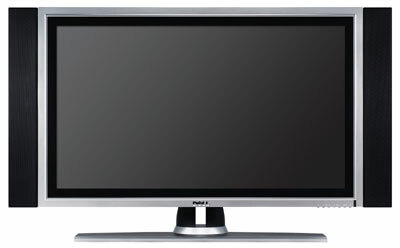 If not for a couple of glaring faults, the Dell W3201C would be our favorite LCD television set. It comes in an attractive cabinet that swivels fluidly, as if its stand were mounted on a hydraulic post. And its speakers were so good, I had to double-check to make sure they came as standard equipment with the set. The tall, thin speakers can mount on the sides of the set or on the included stands. The sound is powerful and very clear, with great separation that you can further improve by moving the speakers farther out to the sides. You can also choose from sound modes such as those for voice and movies--good for folks who have trouble discriminating among concurrent sounds. You'll even find a port for a powered subwoofer on the back panel of the set. The W3201C was the only set in our current test group to include two HDMI ports, which are great for connecting both a cable set-top box and a DVD player, for example. It has dual tuners, too, but it doesn't have a CableCard slot, so you can use the digital tuner only for over-the-air digital broadcasts; you'll still need a set-top box to bring in cable or satellite broadcasts. The remote control is pleasing, and its buttons feel substantial; when you press a button, you know it's going to work. But the buttons are extremely shiny, and glare from external lighting sources makes the labels hard to see. They light up when you push them, though. Unfortunately, in image quality this set ended up last, trailing behind the other four tested sets in the group. Many screens looked too dark, with garish, oversaturated colors. Dell provides good color controls, however, so you could probably tune some of that out; the unit's on-screen controls are attractive, and you can vary their opacity so you can see what you're adjusting. Upshot: The W3201C would be a runaway winner, if only its image quality were better and it had a CableCard slot.